If you watched Sesame Street as a kid, are a fan of the Star Wars movies, or enjoy any of the holiday classics like Rudolph the Red-Nosed Reindeer, chances are you too are a puppetry fan! 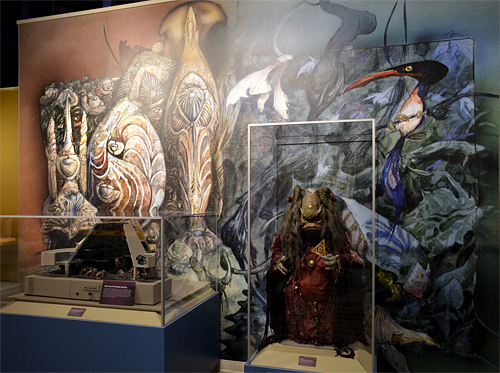 On the off chance you've not been to the Center for Puppetry Arts since before mid-November 2015, and especially if you've never been, well, ♫ it's time to start the music...it's time to light the lights ♫...it's time to go see the Center for Puppetry Arts' new and expanded Jim Henson Collection! 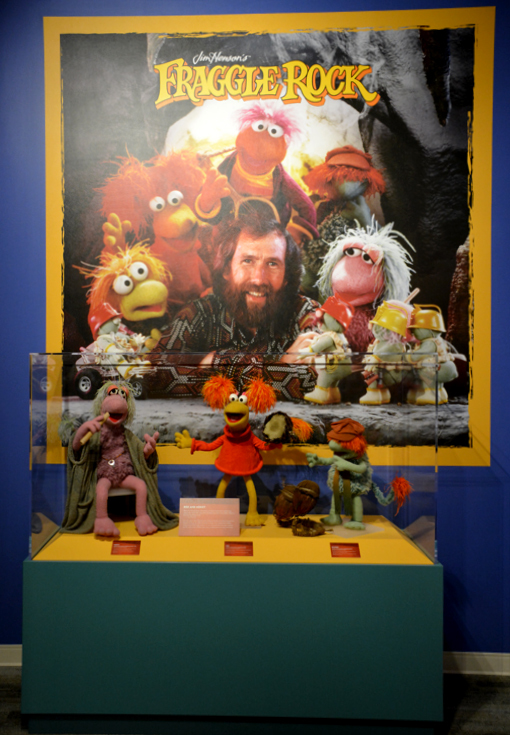 This post is about the Jim Henson Collection, part of the new Worlds of Puppetry Museum. I'll write about the new Museum's magnificent Global Collection another day. 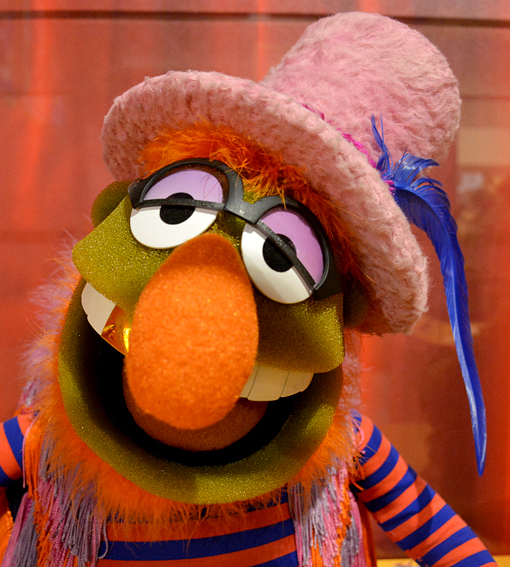 In the meantime, let's talk Muppets, Fraggles and The Dark Crystal, to name only a few highlights in the Museum! 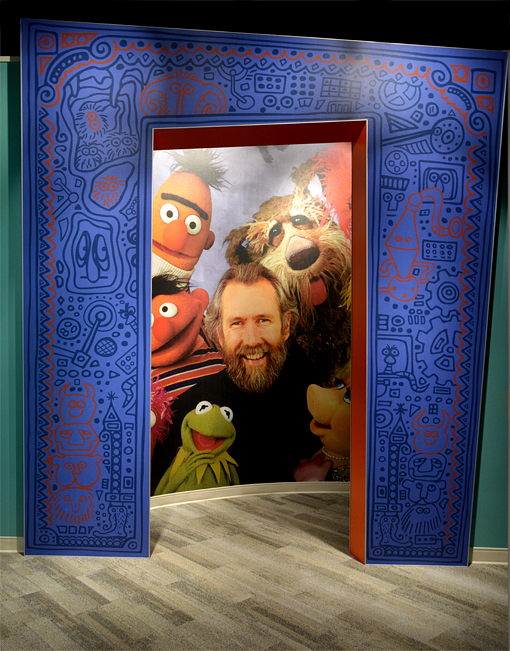 You will be greeted by Jim Henson himself upon entering the Jim Henson Collection side of the Worlds of Puppetry Museum, along with personalities from throughout the decades. There is LOTS to see here...some of it interactive, all of it fun! Be prepared for a lovely, laugh-filled stroll down memory lane while discovering the fascinating career of one whose creativity and intellect brought to the world great learning, loving and laughter. 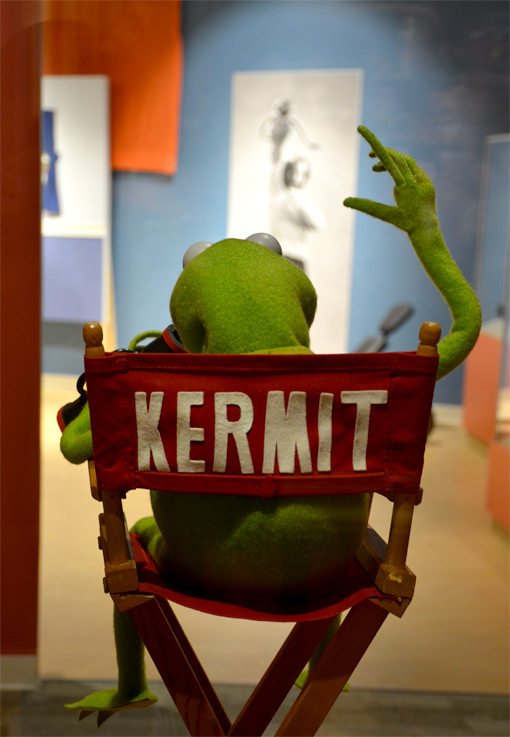 The Jim Henson Collection side of the Museum features gallery after gallery, one of them being Jim's office, which contains loads of memorabilia that you too would showcase in your office. 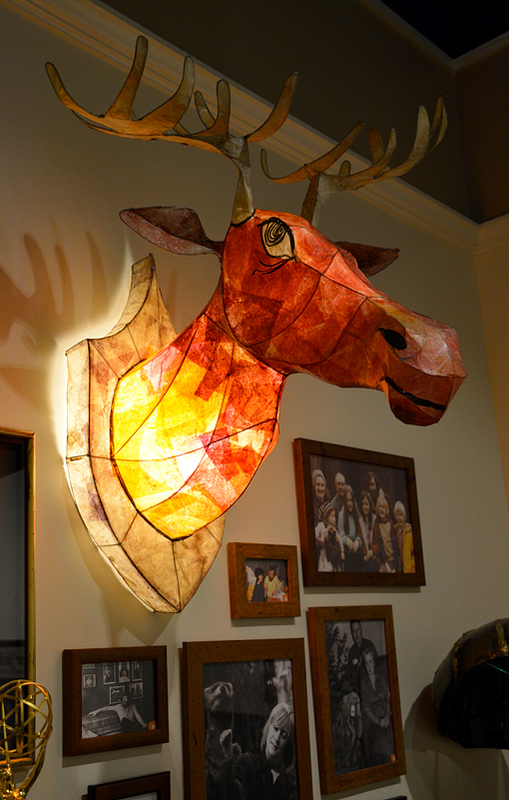 Among the artifacts is a giant, illuminated moose head! Actually having seen a live moose up-close-and-personal in wild of Wyoming (I didn't know at the time that they sometimes charge), I can tell you that this head is probably life-size. 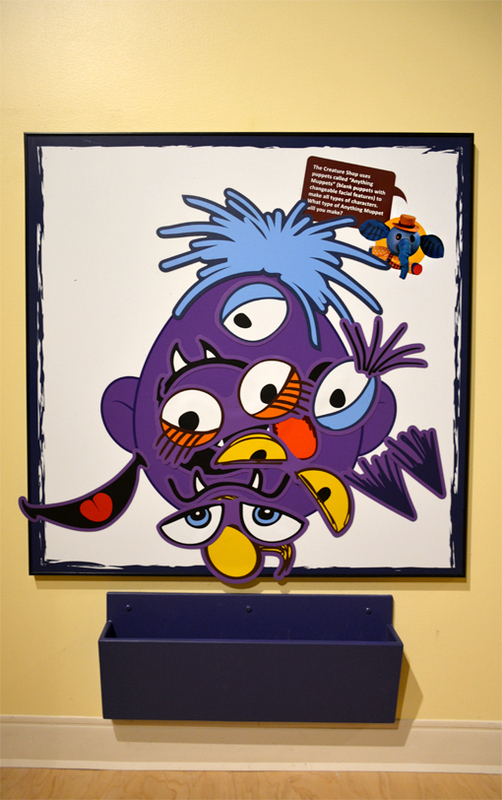 There's also a gallery featuring an interactive creature shop (some of the drawers pull out to reveal even more puppetry artifacts). There's a mock-up television studio, too, and throughout the Museum there are video clips of some of everyone's favorites, from Sam and Friends to The Muppet Show and lots more! We're so fortunate to have the Center for Puppetry Arts here in Atlanta. We're also fortunate to have so many awesome opportunities to meet celebrities. In fact, I got to see Carol Spinney, the puppeteer who portrayed Big Bird all those years I watched him on Sesame Street. That was one of those experiences--seeing Spinney at Dragon Con--you never even fathom would happen, but that you'll cherish always. I love that Jim Henson's land of make-believe was so close to real life. 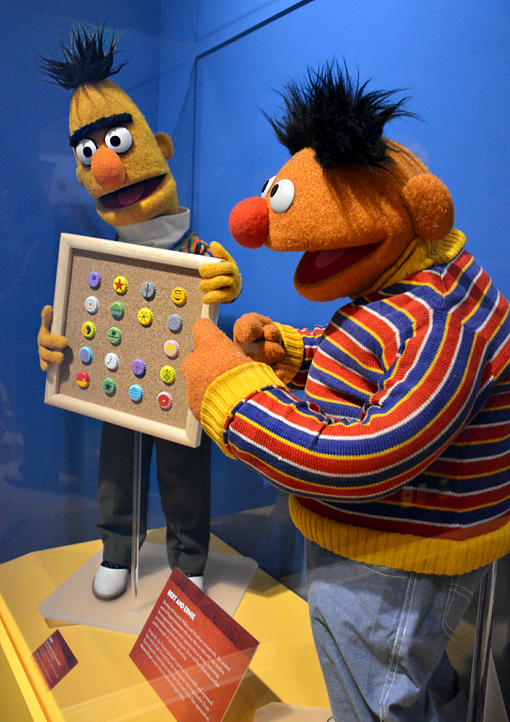 Take for example Bert & Ernie, one of Henson's classic contrasting personality duos, and how cooperation, even in the face of being totally different people, could often produce wonderful results. As a kid, I wasn't at all grumpy, so I identified with the more enthusiastic Ernie. Can you believe that Bert & Ernie debuted on Sesame Street the same year we landed on the Moon? We've seen a LOT of puppets since 1969, but these two will remain favorites forever! Notice how close this display is to the floor? 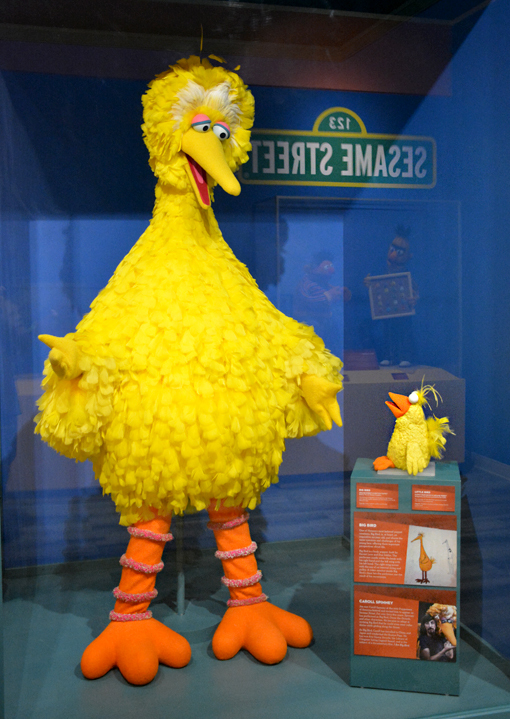 When you see that little "blue elephant" (seen in the upper right hand corner in the above photo), it's an indicator that that particular display is specially made for the Museum's visiting youngsters, for those as height-challenged as Kermit himself. That blue elephant can be found throughout the museum...your youngster will probably see them before you do, though! I have such fond memories of Fraggle Rock! I would rush home from school to make sure to catch the whole episode. What a fun show that, unbeknownst to me when I was a kid, demonstrates the greatness that is possible when acceptance of differences is embraced. I just thought I was watching a fun show, but today I'm grateful it kept my moral compass pointed in the right direction. 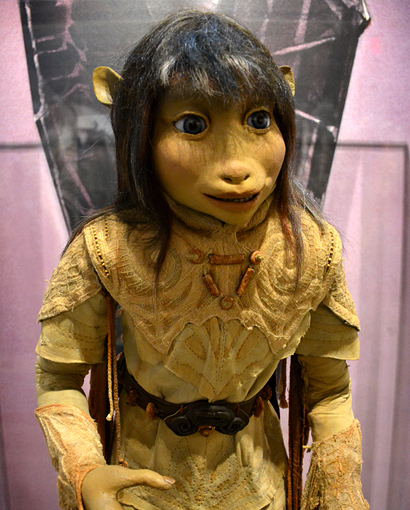 I'm embarrassed to admit that before visiting The Jim Henson Collection in the new Worlds of Puppetry Museum, I had never seen The Dark Crystal, a Jim Henson film. Fortunately for me, when I left the Museum I stopped by the gift shop (of course I did!) and they had a copy which I immediately scooped up and watched not too long after arriving home. When you stop by the life-size Jen display, be sure to read about the Yoda connection. Yes, yes...there were forces going on behind the scene that connect Jen and Yoda. I'll leave it to say that Gary Kurtz, George Lucas and Jim Henson were all involved. The Center for Puppetry Arts also offers a film series. Remaining in the 2016-2016 season is a screening of "Labyrinth", starring the late David Bowie. The first three screenings of this film have already sold out, but a fourth screening was recently added. But hurry if you want to see it...I'm certain it too will sell out. When you're planning your visit to the Center for Puppetry Arts, be sure to explore their website and calendar for a multitude of things to do beyond the Museum. They offer a Create-A-Puppet Workshop, there are stage performances, guided tours (including a special one on just The Jim Henson collection) and a regular film series! That this museum has so much to offer was a contributing factor of my becoming a member. I've already had great fun using my new favorite membership! Look for my post on the Center for Puppetry Arts' "Global Collection", part of the new Worlds of Puppetry Museum, in the not too distant future. In the meantime, enjoy this 2008 video featuring one of my all-time favorite muppets...Beaker!